Is there a common language that transcends the evolutionary boundaries between insect and human? Loren Kronemyer was born in Los Angeles, California, graduating from the San Francisco Art Institute in 2010 with a BFA in New Genres and the department's highest award. Her work involves poetic, yet absurd interactions between the individual and the environment, including other humans, animals, and forces of nature. In attempting to reach across boundaries of time, place, scale, and species, she implicates the dominant cultural forms of the present to create meaningful documents of alternative relationships to the world. Myriad, the body of work surrounding Kronemeyer's Masters degree, focuses on the shared world between humans and ants. By delving into their complex sociality and behaviour, she seeks to achieve interspecies communication through the shared language of line and motion. 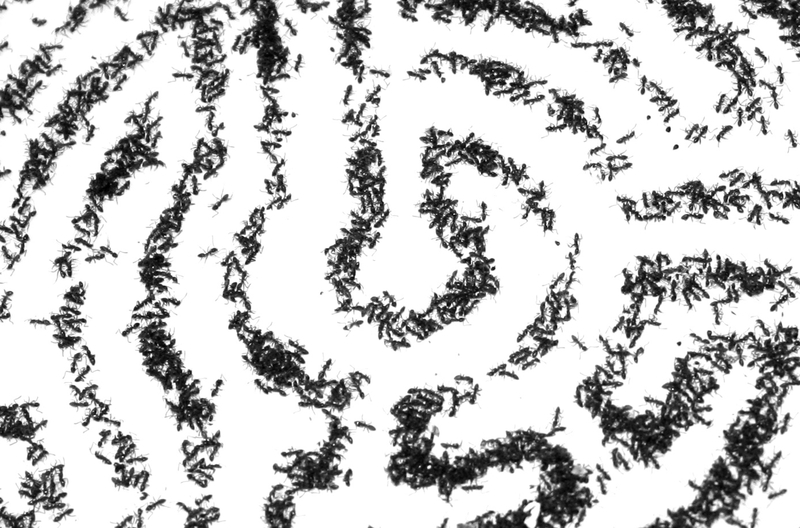 Beginning with pheromones and ending with more dramatic interventions, she attempts to lure ants into complacency, translating their behaviour into recognisable symbols and texts that fluctuate as the balance between insect and human influence shifts. The results lie somewhere between order and chaos, hinting at a deeper language that underlies the world of human structures.